Powder coatings used in the electrical industry are manufactured as a fine powder, perhaps dust would be a more descriptive term to use, and are applied to metal. The most common application method is the use of static electrical charges on the metal part to attract the coating powder. The thickness of the application is controlled by the application time. Once applied to the metal, the powder must be bonded to the metal or the powder will simply fall off the metal. The bonding is usually accomplished by heating which melts the powder for good flow coverage and adhesion. The bonding to the metal is accomplished by the heat. Please note: We do not manufacture powder coatings at our lab, we only test powder coatings. At this time, the only common chemistry used as Powder Coating Insulation is the Epoxy Chemistry. Only the measurement of Electrical insulation Strength is logical. Any testing for mechanical strength would evaluate the metal substrate rather than the coating on the metal. For these materials there is only one LTTA program. The test specimens must be provided to the test lab in the ready-to-test finished condition. AS with any EIM, the powder coatings can be evaluated as part of an EIS. The same test method would be used. The critical aspect is how to apply the powder coating to the metal parts to be used in the EIS test. For EIS testing, the preferred application is to apply and bond the powder coating to the channel pieces. Since most epoxy materials do not adhere to stainless steel (the preferred metal) the EIS channel pieces can be made with “cold-rolled” steel. In the electrical industry there are two key types of application. One is for the electrical insulation characteristic as in insulation applied directly onto the conductor; this means the insulation is serving as an electrical insulation barrier and is defined as a major insulation material. 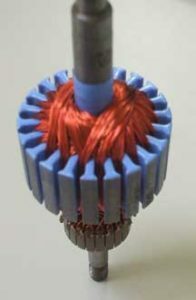 The other is the application of the powder coating onto the metal other than the conductor, including onto the steel core stack. For the application of the coating onto the core steel, the powder coating material is selected for physical protection as well as the electrical insulation between the winding coil and the core metal. When used to separate the energized coil from the metal core stack, the insulation serves as a major insulation material. When the application is for the powder coating to be applied directly onto the conductor, it is known as Bus Bar insulation. 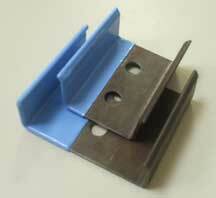 For Bus Bar applications, the conductor is expected to be only of bar construction, as the coatings are not flexible. For these applications, the metal is expected to be either copper or aluminum, and the test specimens are to be made using either copper bars or aluminum bars. The epoxy (EP) chemistry is not flexible or cannot expand at the same rate as any of the metals. This limits the EP products because the thermal expansion of the metal at higher temperatures (during testing or during operation) must result in physical fracture of the coating; resulting in insulation failure. For the application to the metal core stack, the application could be for motor slot insulation (Slot Liner) or applied to metal for enclosures or housings. The only one of these applications requiring Long Term Thermal Aging is for applications which separate the wound coil from the bare core metal. For this LTTA, the test specimens are to be made using steel, not copper or aluminum. 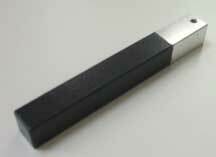 One test method is described in UL 746-B. In this method there are two shapes possible for the metal test bars. The first of the two is described as a “U” shaped channel. This shape is expensive due to special machining of the metal pieces. It is also time consuming, resulting in increased cost for preparation. 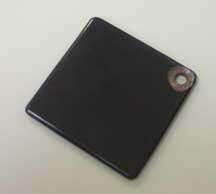 The “alternate” shape is a simple square shape which is readily available and requires no special machining. This is the shape recommended by ELTEK Labs. The test specimens must be provided to the test lab in the ready-to-test finished condition. Also, the specimens need to be mounted onto a rack. For this mounting, each specimen needs to have a small hole drilled through the top uncoated end of the specimen. The test method is the same for both categories of application with the type of metal being the distinction for the use of the results. Slot liner or other applications over steel is preferred to be described as a Powder Coating application; the metal to be used is steel. For Bus Bar or other applications where the property is for electrical insulation is preferred to be described as a Bus Bar application; the metal to be used is either copper or aluminum. The industry standard policy for magnet wire insulation is that any thermal class rating assigned to an insulation when tested over copper can be assigned to aluminum, but not the reverse. This is not the case for Bus Bar applications. For Bus Bar applications the thermal classification applies only to the specific metal used in the test. If the powder coating is intended to be marketed for Bus Bar applications and to be used over both copper and aluminum, the powder coating must be tested over both metals. For full industry coverage, the same powder coating needs to be evaluated (tested) over three metals; copper, aluminum and steel. The test methodology uses a Proof Test Voltage and with this type of methodology the Fixed Temperature methodology is the logical one. This approach uses four sets of ten specimens in each set; total 40 for the expected LTTA test. The Fixed Time Frame Method (FTFM) is also available but the number of test specimens needed is much larger and hence the construction of the test specimens would be more costly. If the cost of the larger set of specimens is not a factor the FTFM benefits of known completion time may be a worthwhile approach. This approach uses 8 to 10 sets of 10 each for a total of 4 x 10 = 40 x 8 tests = 320 to 4 x 10 = 40 x 10 = 400 specimens. To arrange powder coating and bus bar insulation testing, request a quote online now or call 636-949-5835.